The PRI Show, the Performance Racing Industry’s crown jewel of shows has some mighty power on display. But none greater than the Goodwin Competition Platinum Engines that have been in development for the Platinum 388 Skaters of Bill Pyburn and Chris Bradley. One of the engines is on display in the famous ARP booth. ARP is the racing industries premier fastener manufacturer, and ARP is virtually the supplier to every engine builder in the country. For ARP to request the engine be put on display in their booth is a true honor and reflection of the quality of a product being produced by Todd Goodwin of Goodwin Competition engines. The engine on display features many new features that have been derived during the development of these Platinum packages. From the 5 inch bore, Hemi Head, all billet construction, with new integrated cooling system advancements to the very rear of the engines custom flywheel and custom 2000HP drive plate system (Feature Story coming soon). While the engines gleam like show pieces from the candy colored superchargers to to the polished hardware there has been no aspect of the finishing of these engine that hasn’t gone through scrutiny of the Goodwin crew as they spent four months in development on corrosion coating testing to ensure not only would the engines look amazing they would stay that way. 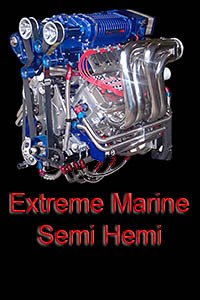 When it comes to design, custom manufacturing and the packaging of these engines they are the most aggressive application of high tech high horsepower ever placed into a power boat we have yet to see.